Sublime – if I had to describe the evening in one word that would be it. 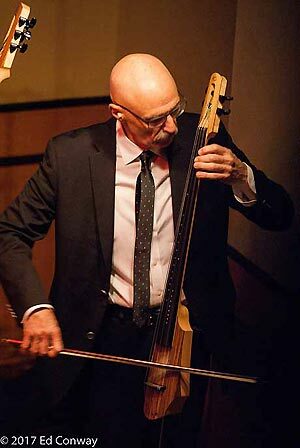 Brothers Pete and Tony Levin, each have a storied musical history. While you may not be familiar with their names, if you have listened to music, you have heard them play. Pete has worked with such diverse artists as Miles Davis, Gil Evans, Annie Lennox, Paul Simon and Salt ‘N Pepa, the full list is far too long to include here. 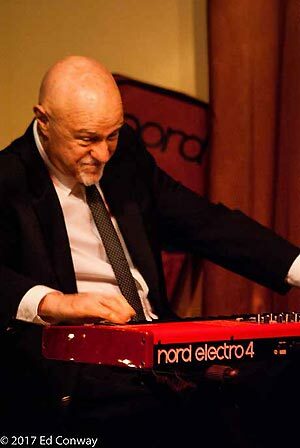 Tony is best known for his work with Peter Gabriel, King Crimson and his own band The Stickmen. While each had taken turns playing in each others bands, they had never worked together on their own project – thus the Levin Brothers were born in 2014. Since each had such a wide range of musical experience, picking a style might have been considered the hardest part, but they chose what they had listened to as children, bebop jazz. 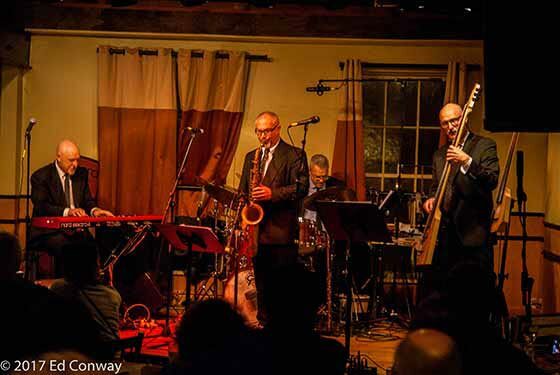 While I am not as steeped in jazz as some others here at Nippertown, I found their songs to be quite approachable and enjoyable to listen to during their recent return to Schenectady’s Van Dyck. The selections had an identifiable melody running through them while allowing each musician a chance to demonstrate their virtuosity. 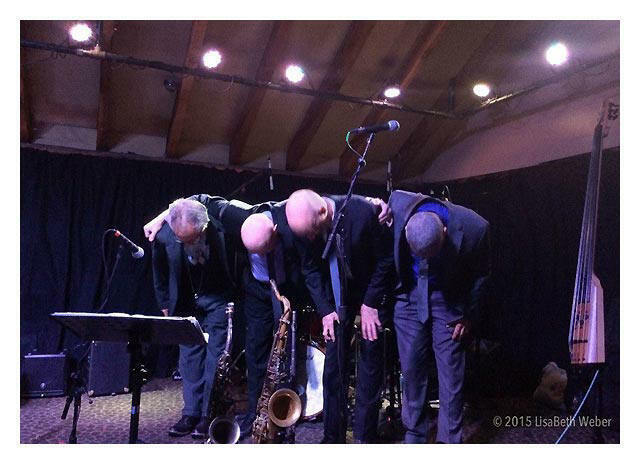 Erik Lawrence, standing between Pete and Tony, was the closest thing to a frontman an instrumental quartet can have. 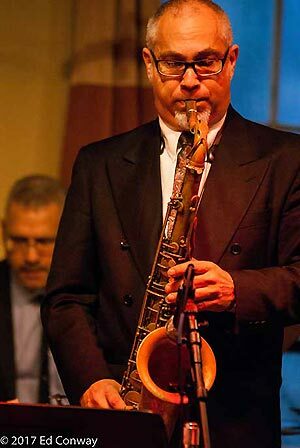 While providing the basic melody lines on tenor sax and flute, he also provided the majority of solos during the set. 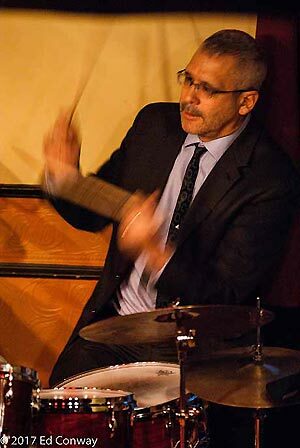 His resume includes founding member of the Levon Helm Band as well as playing with such luminaries as Bob Dylan. Holding down the rhythm was Jeff “Siege” Siegel, best known in this area as the drummer for the late Lee Shaw. As the musicians took the stage, a complete hush came over the audience, to which Pete quipped, “What happened?” What happened was the anticipation of a the wonderful music to come and the audience was not disappointed. Pete and Tony are rightfully proud of their musical history, and songs from Pete’s touring with Paul Simon and Tony’s work with Peter Gabriel and King Crimson were featured in the show. But I thought the highlights of the evening were the original songs they wrote for the album. There was a genuine love for the form of music that shaped them as children. There is something magical about coming back to your childhood after such divergent paths throughout one’s career. The joy of them as children sitting around listening to music comes through, and it took us back to what we loved as children as well. 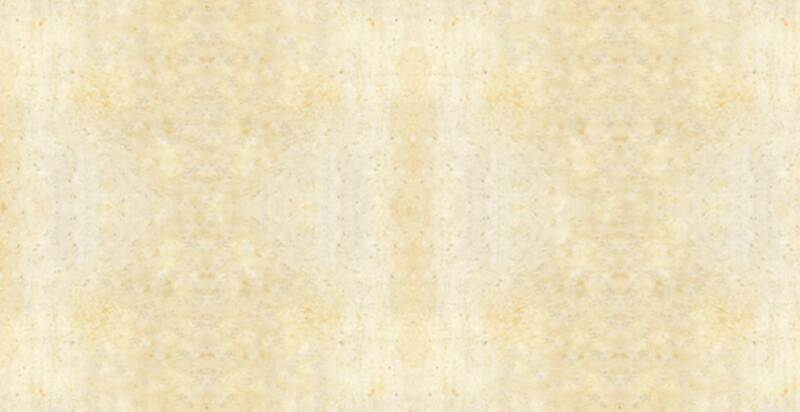 To borrow a word from Pete, the Levin Brothers were simply “engroovilating” at the Van Dyck.